It has been a while! Life has caught up to me, and I am sorry for that! 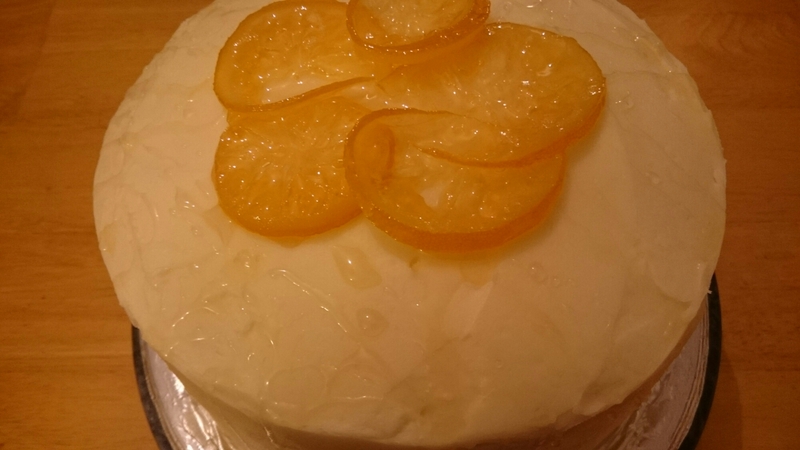 However, let’s get things rolling again with a fantastic cake to help round off the month of February! A very good friend of ours came down to Lethbridge for the weekend to celebrate his birthday. That only meant one thing – a fancy, home-cooked dinner and a fabulous dessert to go along with it! Paul decided to make a rotisserie chicken with cheesy broccoli and cauliflower and a rice pilaf. 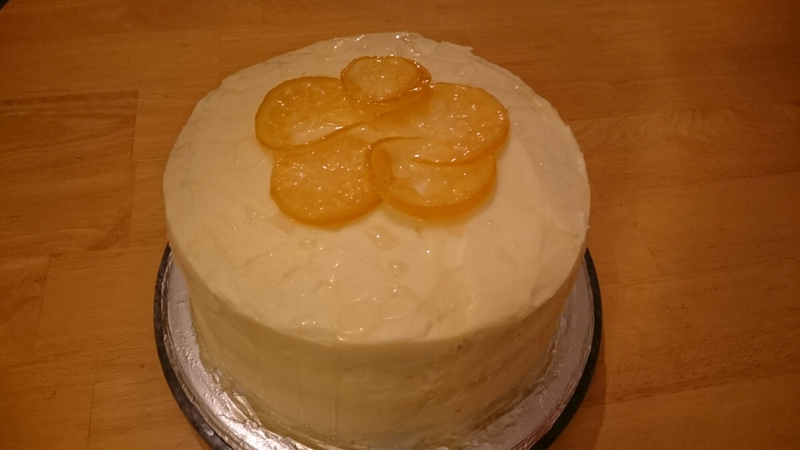 When I asked Darren what he wanted for a birthday cake flavour, his answer was “Something simple like vanilla or lemon.” Well, vanilla and lemon are both simple concepts, but I decided to combine the two to make something simply amazing! Of course, the first place I went was the wonderful Annie of Annie’s Eats. Her cakes have been inspiring me for years, and this recipe was no exception! 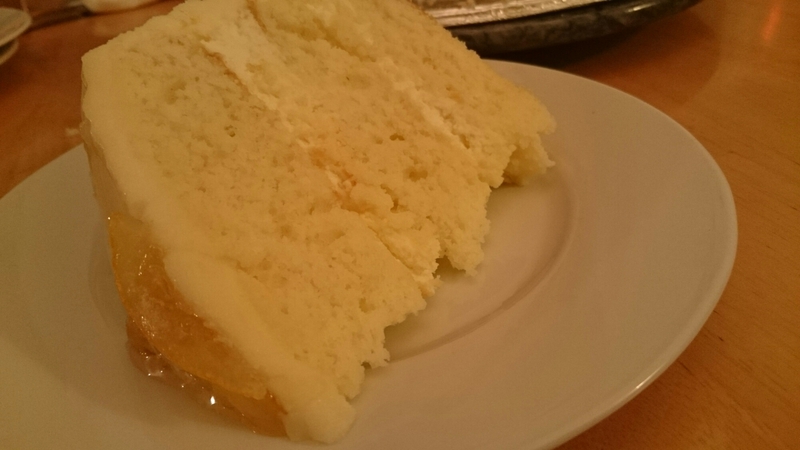 Combining a luscious lemon cake with a light, lemony mousse-like filling, and a vanilla buttercream frosting? This cake sounds like heaven! The only real change I made was substituting extra vanilla extract for the vanilla bean seeds. I do not currently have any vanilla beans, and I need to make this change very soon, but I decided to just put the extra punch of vanilla in the frosting instead. I will note that in Annie’s recipe, she says you will have frosting left over. I didn’t, and I mixed the frosting up even slightly longer than she recommended, just to make sure it was as light and fluffy as I could get it. This cake does take some time to make, and its various components are worth the work. 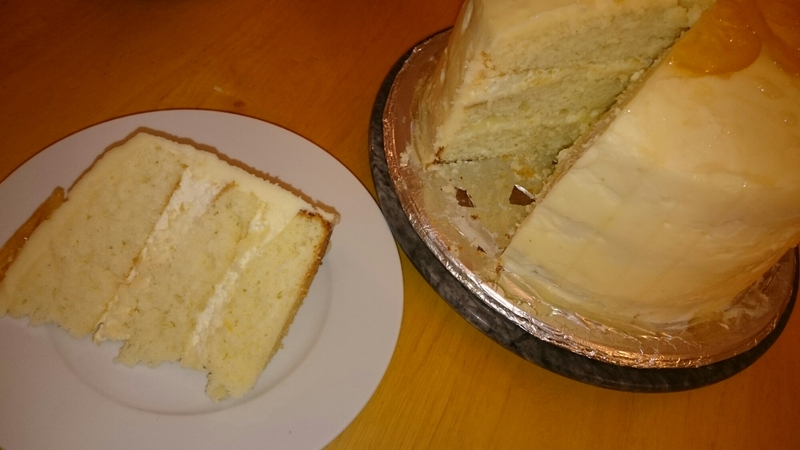 Still, if you like lemon, vanilla, or a combination of both, take a day and make this cake! You won’t be sorry! In a medium bowl, combine the flour, baking powder and salt. Whisk together and set aside. Add the butter to the bowl of a mixer fitted with the paddle attachment, and add the lemon zest to the bowl. Beat on medium-high speed until light and creamy, about 3 minutes. Scrape down the sides of the bowl, and beat for one minute more. Add the sugar to the butter mixture, about a ¼ cup at a time, mixing for about a minute after each addition. Mix in the eggs, one at a time, beating after each addition. Combine the buttermilk, lemon, and vanilla extracts together in a liquid measuring cup. Add the dry ingredients and buttermilk to the butter mixture in alternating increments, beginning and ending with the dry mixture. Mix until just incorporated, then beat for about 15 seconds longer. Divide the batter equally between the three pans, and bake until golden and a toothpick inserted in the center of the cake comes out clean, about 20-22 minutes. Be sure to rotate the pans halfway through baking. Let cool in pans for 10 minutes, then invert onto wire racks to cool completely. For the filling, combine the cheese and butter in the bowl of a mixer fitted with the paddle attachment. Beat until smooth and well-combined. Mix in the icing sugar and beat until just incorporated. Blend in the lemon extract and lemon zest, on medium high speed until the mix is light and fluffy. Transfer the mixture to a medium bowl and set aside. Wipe out the mixer bowl, and attach the whisk attachment. Pour in the heavy cream and beat until stiff peaks form. Mix a third of the whipped cream into the butter mixture, and blend until smooth and evenly incorporated. Gently fold in the rest of the whipped cream until evenly incorporated. Refrigerate until needed. For the frosting, add the butter to the mixer bowl fitted with a whisk attachment. Whip about 1 minute, until smooth. Add the icing sugar and beat on low speed until just incorporated. If using a vanilla bean, scrape the seeds from the pod and add them to the butter, along with the salt. Continue to beat until smooth. Mix in the vanilla extract and heavy cream on low speed until just incorporated. Increase the mixer speed and beat until light and fluffy, about 4 minutes. Refrigerate until needed. For the candied lemon slices, wash lemon and dry thoroughly. Slice as thinly as you can with a serrated knife, and poke out any seeds with a toothpick. In a saucepan, combine the water and sugar over medium-high heat. Heat the mixture until the sugar dissolves, and add the lemons in a single layer, none overlapping. Reduce the heat to medium-low and let simmer 20 minutes, turning at least once so both sides are exposed to the mixture. Remove from heat and store in a container with the syrup until ready to use. I have been looking for the perfect brownie recipe for a long time. 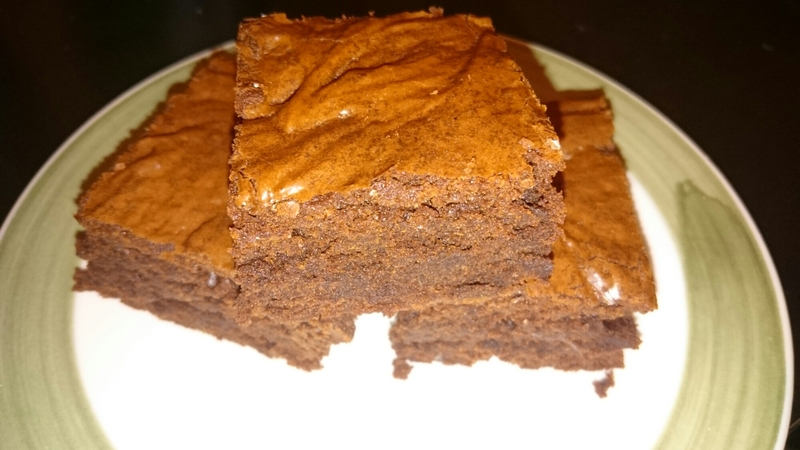 A nice, thick, fudgy brownie, slightly soft and ever so gooey in the center. That crisp, crackly crust on top. Brownie perfection. My friends, and dear readers, I think this is it. This is an absolutely phenomenal brownie, that bakes up nice and tall. There have been many brownies in my life, and none of them have really fulfilled all of the criteria I listed. I have been singing Annie’s praises since I found her website, and when she proclaimed that these brownies were the one, I knew I had to try them. It’s been about a year since I made brownies, and finally being in the brownie mood, I decided to give these a try. Oh my goodness gracious, these brownies were fantastic. Tall, fudgy, crackly, soft, and absolutely heavenly. Paul wanted them iced with a simple chocolate buttercream, but I wanted to just have the decadence of the plain brownie. I think these iced or frosted would be fantastic, but they are just as good with a big glass of ice cold milk. If you are having a chocolate craving, or are in need of some brownies, go make these now. 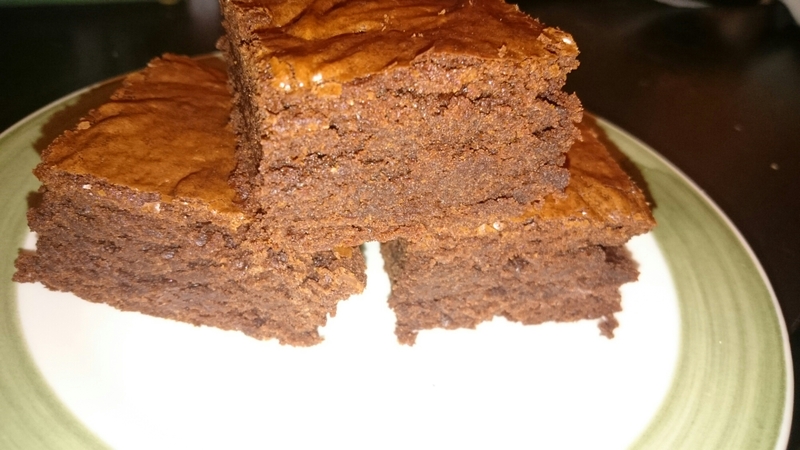 I think these brownies have become my one recipe for brownies. Now, the modifications will just come with time. The possibilities are endless! Peanut butter, caramel, pretzels. 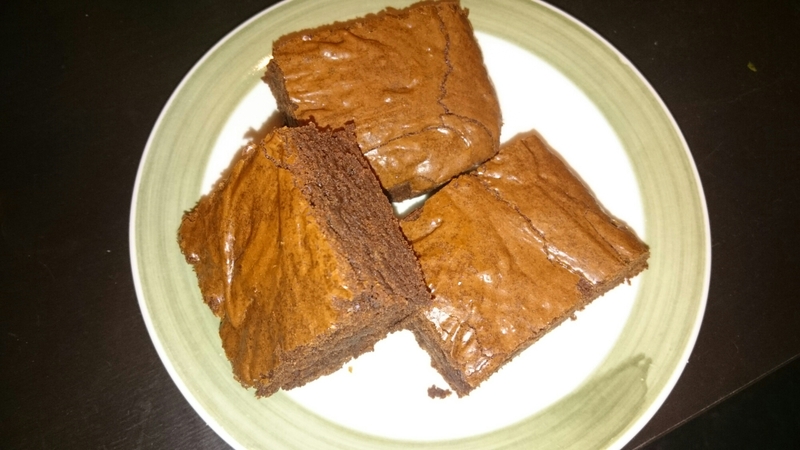 Brownies are a perfect vehicle for an endless amount of flavour combinations! Preheat the oven to 350°F. Line an 8 x 8 inch baking pan with foil, and spray lightly with cooking spray. In a double boiler, with the water simmering but not boiling, place the chopped chocolate and the butter in a heat proof bowl. Whisk occasionally, until the butter and chocolate are melted together. Stir in the cocoa powder until smooth, and take off the heat. In a large bowl, whisk the eggs, sugar, vanilla and salt until combined. Stir in the warmed chocolate mixture until combined. With a wooden spoon, stir in the flour until just combined evenly. Spread the batter into the greased and foiled pan and make sure batter spread out evenly. Bake in the preheated oven for 35-40 minutes, until a toothpick inserted in the center of the pan comes out with some sticky crumbs attached and the middle is slightly puffed. Transfer to a wire rack and cool to room temperature. Remove foil from pan, and cut into squares as desired. Just in time for Valentine’s Day, I am posting this scrumptious treat! Paul and I do not actually celebrate Valentine’s Day (being in the restaurant industry, you usually have to work on days like that, instead of being able to celebrate anything), and we much prefer understated declarations of romance, instead of going over the top. 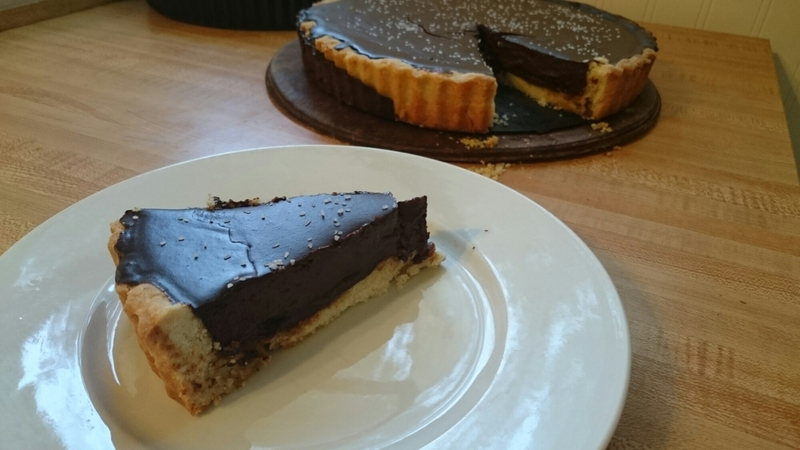 I have wanted to make a tart for a while now. I have two full size tart pans, as well as a set of four smaller pans, and they still have not been used! Finally, I broke out the tart pans, and found a tempting recipe to make. On my Pinterest board, I have quite the collection of desserts, and a small collection of tarts. While I do have a bag of frozen strawberries in my freezer, and was extremely tempted to make a strawberry tart, I chose to make something decidedly more extravagant and indulgent. I found the recipe here, and the best part is that it involves homemade salted caramel. Anything that involves homemade salted caramel must be good, right? 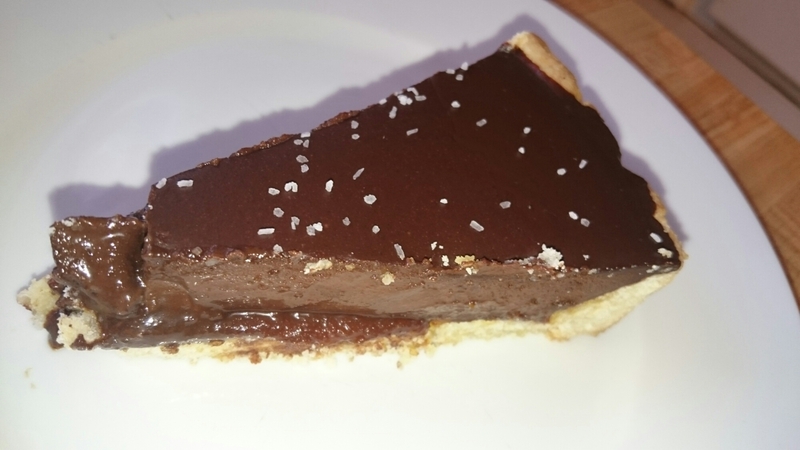 Add a luscious chocolate ganache, a dusting of salt, and a crisp cookie crust, and helloo, lovely. For the tart shell, in the bowl of a stand mixer fitted with the paddle attachment, cream together the butter and sugar until fluffy. Add in the eggs and mix until just incorporated. Add in the flour and salt, and mix just until the dough comes together, on low speed. Scrape the dough into a flat disc and wrap in plastic wrap. Refrigerate for at least an hour, or overnight. On a lightly floured work surface, roll out the dough to a ¼-inch thick round. Press the dough into a 9-inch tart pan, trimming the excess dough. Place the shell in the freezer until ready to bake. Preheat the oven to 350°F, and line the tart shell with parchment paper and fill with pie weights. Bake shell for 30 minutes. Remove the parchment paper, and bake for 10 minutes more. Allow to cool while you make the filling. For the caramel, bring the cream to a boil and then turn off the heat. In a heavy saucepan, combine the sugar with 5 tbsp. of water and cook, stirring over high heat until the sugar dissolves. Bring to a boil and let cook for about 4 minutes, until it reaches 374°F, swirling the pan as needed. Do not stir the caramel! Only swirl the pan. Remove the pan from the heat and whisk in the hot cream. Stir until smooth. Add the salt, and whisk again. Pour the caramel into the tart shell so that the bottom is evenly covered, and let cool. Refrigerate until ready to pour in the ganache. For the ganache, place the chocolate and salt in a heatproof bowl. Bring the cream to a boil in a saucepan. Pour the hot cream over the chocolate and let sit for 3 minutes. Whisk the chocolate into the cream until they are melted together. 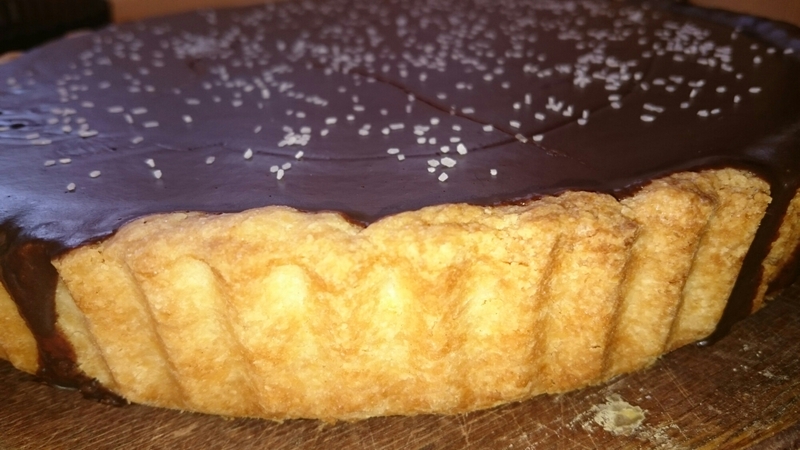 Pour the ganache into the tart shell, and allow to set at room temperature. Sprinkle with sea salt before serving.